Fresh from closing a reported $60 million from Institutional Venture Partners with the Chernin Group, valuing the Berlin-based company at $700 million, SoundCloud is not resting on its laurels. Today it launches a new “visual” version of its embeddable player. This puts the artwork of an artist at the centre. 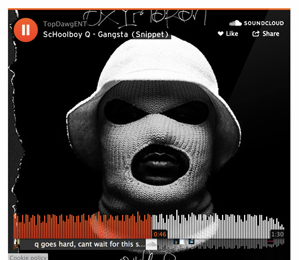 There is also an improved look for Soundcloud’s iconic waveform to delight listeners. Key artists being used to promote the new player include The 1975 with “Chocolate” (a new remix); a new Steve Aoki & Autoerotique vs. Demitri Vegas & Like Mike “Feedback” song; and Schoolboy Q with a 90 sneak peak of the new track “Gangsta” from his upcoming album OXYMORON. Comedy podcasters Jake and Amir have also been employed to explain the player. There is now the ability to have ‘continuous listening’ in the visual player, where related tracks are showcased during pause and after finishing playback allowing users to explore music and audio straight after. Pro Unlimited have extra features, with Spotlight being displayed in the player during pause and after playback instead of other related tracks. The existing formats will continue to be available but they get a makeover of the waveform to make them look like the new visual player.